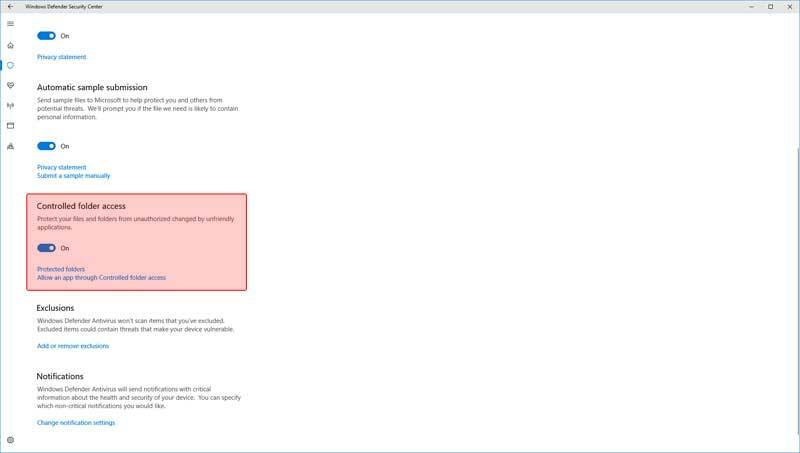 With the release of the Windows 10 Fall Creators Update tucked inside of the Windows Defender Security Center is a new feature called Controlled Folder Access. Controlled Folder Access What is it? It purpose and function is to “Protect you files and folders from unauthorized changes by unfriendly applications.” Read this as your files cannot be edited or changed. This new feature is offered as a tool to help protect files from encryption ransomware and other malware and virus threats from altering files by way of Controlled Folder Access. It sounds like a good idea but currently in practice I would imagine few ordinary users will go through the current process to configure this feature. It would not take much effort by Microsoft to improve and simplify this process of configuration. One way to improve the Controlled Folder Access feature would be to have a list of the installed applications to choose from to allow Controlled Folder Access. Currently you have to search for and select an application that you want to allow Controlled Folder Access. Which is cumbersome for even a Windows 10 wizard. As an example it took some time for me to figure out exactly which file I had to add for Open Office to be able to function with file in My Documents folder. After trying all the program executable it turned out to be the file C:\Program Files (x86)\OpenOffice 4\program\soffice.bin. Another option I would like to see is the option to remove folder from the default protected folders list. At this time there is no way to do this. The video below shows the location of the Controlled Folder Access setting and how to allow an application access to the Controlled Folder Access Windows 10 Fall Creators Update folders. Also shows how to add a folder to Controlled Folder Access list. Controlled Folder Access Windows 10 Fall Creators Update Video Enable Setup Add Folder and Allow Application Access.